We live in a world of optical marvels--from the commonplace but beautiful rainbow, to the rare and eerie superior mirage. But, how many of us really understand how a rainbow is formed, why the setting sun is red and flattened, or even why the sky at night is not absolutely black? 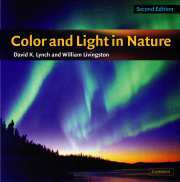 Color and Light in Nature provides clear explanations of all naturally occurring optical phenomena seen with the naked eye, including shadows, halos, water optics, mirages, and a host of other spectacles. Separating myth from reality, David Lynch and William Livingston outline the basic principles involved, and support them with many figures and references. Rare and spectacular photographs, many in full color, illustrate the phenomena throughout. In this new edition the authors have added over 50 new color images and provide new material on experiments readers can conduct themselves, such as how to photograph geostationary satellites with your own camera. David K. Lynch is an astronomer and atmospheric physicist specializing in infrared studies of star-formation regions, interstellar matter, comets, novae, and supernovae. He began his career teaching at the California Institute of Technology and at the University of California at Berkeley. Today, he operates Thule Scientific, a private research institute. He is or has been the Principal Investigator on a variety of NASA, NOAA, NSF, and Department of Defense programs. He lives in Topanga, California. William Livingston has been an astronomer at the Kitt Peak Observatory in southern Arizona since 1959. He helped design and build instruments and telescopes before becoming a solar observer. Livingston has participated in many solar eclipse expeditions in Alaska, the South Pacific, Africa, Indonesia, India, and recently Turkey, but believes that his best sightings of atmospheric phenomena have been from his backyard in Tucson. Preface; 1. Shadows; 2. Clear air; 3. Water; 4. Water drops; 5. Ice and halos; 6. Naked eye astronomy; 7. Observing; 8. Exotic clouds; Glossary; Index.